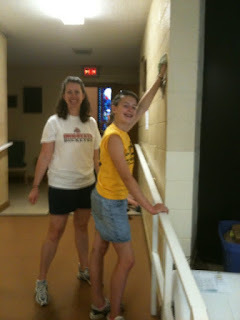 We crossed the finish line strong on the fifth and final day of the Saint Matthew Lutheran Church local mission "trip." We divided into two groups. One prepared the church's fellowship hall for tomorrow's Italian Dinner, the proceeds from which will help to support the servanthood and youth ministries--like the mission trip--of the congregation. Another group put stain onto the two decks of Betty's house. The latter job, which, at first we thought would take about a half-hour, ended up being a two-and-a-half hour task, but looked great when completed. The sun not only seemed to dry the stain in a hurry, but did a fairly good job of baking us, too! But as for you, man of God, shun all this; pursue righteousness, godliness, faith, love, endurance, gentleness. 12Fight the good fight of the faith; take hold of the eternal life, to which you were called and for which you made the good confession in the presence of many witnesses. "Fight the good fight" were words that one of my mentors and spiritual heroes, Pastor Bruce Schein, lived by. He wrote them on his messages to my fellow students and me when we were studying to become pastors at Trinity Lutheran Seminary in Columbus. But these were more than mere words to Pastor Schein. They reflected his own commitment to living completely for Jesus, as well as being an exhortation to all who bear Jesus' Name through their Baptism to do the same. Pastor Schein had a doctorate in New Testament from Yale University. But faith was more than head-knowledge for him. As a young man, he learned that he was suffering from Parkinson's Disease. He decided not to marry, but to use his considerable gifts as both a scholar and a pastor in total service to God and others. For twelve years, he served as pastor of a Lutheran congregation in Jerusalem, where most of his parishioners were Palestinians. It was a challenging ministry that, each day, called him to renew his commitment to service in Jesus' Name. At the same time, he would hike all over the Near Eastern countryside, introducing students from Saint Olaf College and other institutions to the geography, history, culture, and archeology of the Old and New Testaments. Later, he was called stateside to serve as professor at Trinity. He was a challenging professor, expecting us to come to class each day prepared, ready to answer questions and to be pulled and stretched in our faith. Once, aware that others were critical of his interrogative style of teaching, I told him that I appreciated it, feeling as though all my faith muscles were being challenged by the process over which he presided. "Mr. Daniels," he told me, "we're out to make spiritual Charles Atlases of all of you!" Shortly after I graduated from seminary and had taken my first call as a pastor, Pastor Schein became seriously ill, nearly dying. I spoke with him later. "I was in the throne room, Mr. Daniels," he said. "I put in a good word for you." He was still fighting the good fight of faith in Jesus until the end. He died several months later, at the age of 42, offering more service in Jesus' Name than most of us are likely to offer in lifetimes twice as long. The idea behind Christian service such as we've rendered during this week's mission trip, isn't to call attention to ourselves, but to glorify the One Who gives everlasting life to all who believe in Him, Who empowers us to live in love for God and neighbor, and Who gives us the great privilege of being His ambassadors in the world. To all our young people and adults who served this week, I pray that we all will keep fighting the good fight...keep serving and loving in Jesus' Name! Our Savior is worthy of all our honor, effort, sweat, and sacrifice and can use it to bring His love, goodness, and everlasting kingdom to the people we serve each day. Throughout the week, I've been thanking our dedicated young people and our adult supervisors, and I thank them again. But today, I also want to thank those who allowed us to serve. We human beings can sometimes be too proud to ask for help, interpreting such requests as a sign of weakness or personal inadequacy. Often, such reticence exemplifies our sinful natures trumping God's intentions for us as human beings. God made us, after all, to live in relationships of mutual dependence and accountability. The Ten Commandments demonstrate that God's will for humanity is that we live in relationships of love that include love of God and love of neighbor. Jesus later summarized these two tables of the Ten Commandments into what's known as the Great Commandment: to love God and to love others. It's our failure to love that we typically confess each Sunday when we worship together, and it's for the power of the Holy Spirit to live in such love that we pray. But loving others isn't only impeded by our tendency to turn in on ourselves. In Galatians 6, Christians are told, "Bear one another's burdens, and in this way you will fulfill the law of Christ." The only way that can happen is when we are willing to make ourselves vulnerable enough to admit, "I could use some help." When the community of love is activated in this way and Jesus' servants act, not for themselves, but to the glory of Jesus, then something blessed and special happens. So, thank you to all those who allowed our young people to serve them this week! There was a lot of hammering, prying, leveraging, lifting, and lugging today on the fourth day of the Saint Matthew Lutheran Church local mission "trip." We spent virtually our entire day at Cyndy's place, removing the siding from an old--undetermined age--tractor barn. Some of our group also helped remove and sort items from another storage barn. Our young people worked hard and we were blessed to have great adult supervision from members of the Saint Matthew family. The day brought the week's first mishaps. One of our young people obviously reacted adversely to something in the barn and was developing allergy symptoms when we sent him home. There were a few other bumps and bruises. But all in all, people were careful and we got a lot done. We also made a short stop on the way back to the church building in the afternoon, back to the home of Michele, whose deck we treated yesterday. There were potted plants that needed re-placing. It was fun seeing the deck because it looked so good...our young people had done a great job! Originally, Paul wrote these words to a confused church. Some of the Thessalonian Christians, knowing that the risen and ascended Jesus would come back to earth one day to fully establish his kingdom, had stopped working. They argued that it wasn't necessary to work since Jesus would come back soon. These lazy church members became a drain on the members who continued at their jobs, becoming dependent on them for food. They also became "busybodies," their days filled with gossip instead of productivity. Paul tells these idling Christians to get back to their work. Above all, he says, "Do not grow weary in doing right." Loving and serving our neighbors as we've been doing this week is part of the "right" life that Jesus Christ sets us free to live. Christians who sit around on their "blessed assurance," can become busybodies, gossips, irksome pieces of furniture, rather than joyful people using their gifts and their opportunities to glorify God, share Jesus, and serve others. Tomorrow, we plan to stain Betty's deck and then help prepare the Saint Matthew fellowship hall to host an Italian Dinner on Saturday. (You didn't know that German Lutherans are great at Italian cuisine?) Proceeds from the dinner will support youth and servanthood ministries--like this week's mission trip--at Saint Matthew. The fellowship hall of Saint Matthew Lutheran Church, 258 East Hunter Street, in Logan, will be the site of an Italian Dinner on Saturday, June 19, from Noon to 6:00pm. The cost of the dinner will be $6.50 per person. Each dinner will include a salad, diner’s choice of spaghetti or lasagna, bread, a beverage, and a dessert. Proceeds from the dinner will support the servanthood and youth ministries of Saint Matthew Lutheran Church. Saint Matthew is known as the church with Noah’s Ark in the yard. For more information, call the church office at 740 385 2272. Pictures from Day 3 of the Saint Matthew Local Mission "Trip"
Thanks to Beth for snapping these pictures today! These two verses were the passages around which the devotional time for Morning 3 of Saint Matthew Lutheran Church's local mission "trip" was built today. First: Love isn't about affection. (Though only those who truly love show true affection for others.) Love is self-sacrificing commitment to the good of others. Third: When, by faith in the grace of God given in Jesus, we're "at one" with God, God's love lives inside of us. It empowers us and motivates us to live like real human beings--the way God intended human beings to live--in relationships of love for God and others. We don't always feel love, but when Jesus is living inside of us, we can always live God's love...and be given forgiveness and renewal when we fail to love God or others. This week's mission trip is an opportunity and a reminder to live God's love by serving others every day. Today was, by far, the best day of the local mission "trip," so far. Pouring rains last night once more cast a shadow over our plans. But, we learned that when you can't serve in one way, there are still opportunities to serve in other ways. AND...by the end of the day, we ended up getting a lot of what we had wanted to accomplish done anyway! The Luther Room dusted and Pine-Sol cleaned. The curtains were laundered, pressed, and re-hung. Two beautiful pieces of handmade furniture--bookcases--that were originally in the room were put back in there, making a great home for the new Bibles recently purchased by the Saint Matthew women's group. The nursery was similarly scrubbed and dusted from top to bottom. All toys, books, and furniture were cleaned and anesthetized. Carpeting got a thorough sweeping. 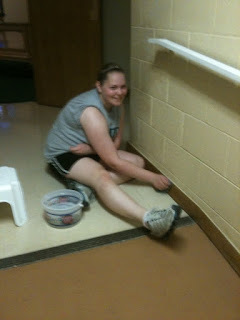 Walls, windows, and ledges in the Fellowship Hall were thoroughly scrubbed. More of this will be done tomorrow. The enormous east stairwell in the educational unit was meticulously cleaned, as was the hallway on that side of the building. 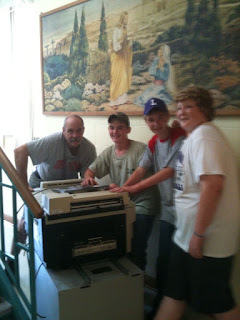 Office equipment and old curriculum materials were taken from the "library" to be recycled. The altar rail in the sanctuary and every pew was scrubbed with Murphy's Oil Soap. One of our mission trippers even set to work to remove gum from the underside of the pews. At last report, every pew but one on the lectern side had at least one glob of gum stuck to it. That was less the case on the pulpit side. (Hmmm, maybe potential offenders have been concerned that Saint Matthew pastors over the past fifty years could spot them from the pulpit.) The whole sanctuary was then thoroughly swept, both with brooms and the vacuum cleaner. The sewing supply closet was cleaned. Once again today, we had troubles with the power washer and so made little progress prepping our church's Noah's Ark for repainting. But, after all that productivity, with the reduced humidity and nice breezes we've had today, we were able to complete the treatment of two decks that several of our crews had power washed on Monday. The first one, that of Tony, a Logan neighbor, was the largest of the decks we tackled this week. One of our adult supervisors told me today that he'd expected it to take all afternoon to get Tony's deck treated. But we took all of our youth to Tony's house. Two of our young people used sprayers; everybody else wielded rollers and paintbrushes. The job was beautifully done in about a half-hour! Michele's smaller deck was done with a smaller crew in about the same amount of time. Go back to Michele's to place her potted plants back on the finished deck. Take the siding off of Cyndy's tractor barn. Do some additional cleaning at the church building. Our young people have been fantastic! Our adult help has been great! The breakfasts and lunches have been wonderful! And hopefully, in it all, the God of love we know in Jesus has been glorified! Go here and here to see information about the first two days of our "trip." God is Awesome to Me! This is the point in the week when, working on the Biblical text for the following Sunday, I become overwhelmed by its richness and profundity, then wonder, "Who am I, Lord? How can I do justice to Your Word this Sunday? How can I preach Law and Gospel to incite or deepen faith in Christ?" For me, every sermon is a miracle--even the ones in which I don't get it right. I truly am in awe of God! This coming Sunday's text is Galatians 3:23-29. I never liked the thing. I'm glad nobody was hurt. What Do You Think of the 42-Foot Faux-Marble Jesus? ...but this only makes me look forward more to Toy Story 3. Genesis by R.R. Reno, an installment in the Brazos Theological Commentary on the Bible, to which I subscribe. I like the commentaries in this series. There's always something new to be learned about the Bible, of course, with new developments from the archeological, social-historical, and linguistic fronts. The Brazos commentaries incorporate these and are written by an eclectic group of scholars, including people of varied denominational and confessional backgrounds. Monday afternoon's severe weather in our area wreaked some havoc on the second day of our congregation's local mission "trip." But one crew was able to paint the mobile home that had been cleaned on Monday. That, arguably, was our second biggest project of the week. Because of all the rain and subsequent humidity, there's no way we could go back to paint the decks that were power washed on Monday. After several frustrating fits and starts, some of us were able to get a power washer started in order to begin work on our congregation's trademark Noah's Ark. (Saint Matthew is known as "the Church with Noah's Ark in the Yard.") Tomorrow, a more powerful washer that's arriving will enable us to get that done so that we can paint the ark later in the week. There's a chance of scattered thunderstorms throughout the next 24-hours. So, we've got some alternative "inside" projects to take on tomorrow. To see some background on this year's mission "trip," go here. 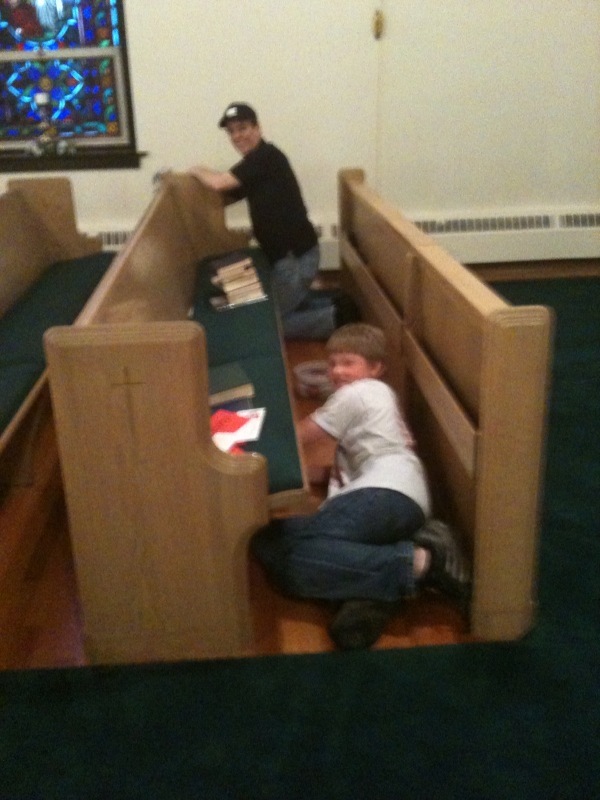 Today brought the first day of our congregation's local mission "trip." 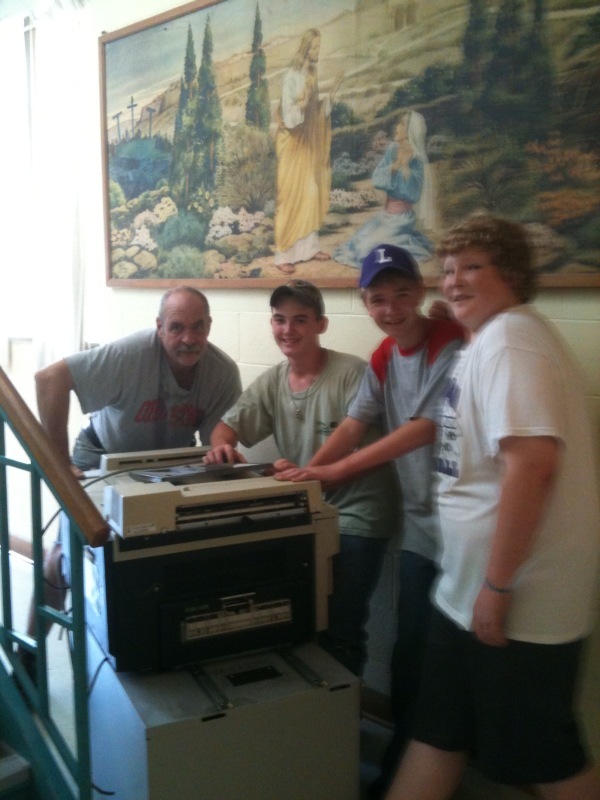 The past two years, several adults have taken groups of Saint Matthew Lutheran Church youth on mission trips administered by Group Workcamps Foundation. I recommend them highly. Tomorrow, weather allowing, we'll paint at those sites where power washing happened today. On Thursday, we hope to tear down a tractor barn. The weather has been hot and steamy here. So, your prayers for good weather would be appreciated. Hopefully, in the days to come, I'll be able to publish some pictures.